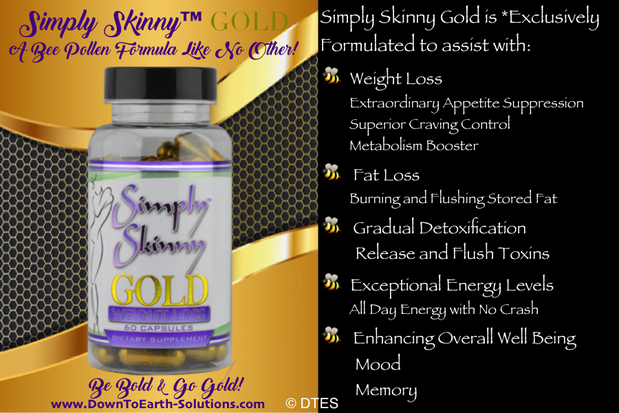 Buy Simply Skinny Gold Now! Simply Skinny™ GOLD bee pollen weight loss supplements can prove to be the best asset you own for weight loss! If your looking for extraordinary results without having to go on a dramatic diet or spend countless hours exercising, then this supplement is what you’re looking for. It makes weight loss "Simple". Simply Skinny™ products are exclusively formulated as your solution in assisting in the transformation and reshaping of your body without having to diet or exercise. Our Simply Skinny™ GOLD not only provides you with an exceptional lasting energy with no jitters and better yet no crash, this bee pollen supplement makes eating less much easier because it can curb the appetite significantly and speeds up the metabolism. *These statements have not been evaluated by the Food and Drug Administration. This product is not intended to treat, cure, prevent, or diagnose any disease. to edit. Simply skinny Gold. I just started taking it but I love it and it controls my appetite without making me jittery. Three days and I'm down 5 lbs. I'm not hungry at all but they do make you thirsty. WOW I have got to say this (Simply Skinny™ Gold) is by far my favorite out of the Simply Skinny products! It definitely curbed my appetite and I had to remind myself to eat. It gave me just enough energy without giving me the jitters. It does make your mouth a little dry which helped me in drinking more water. In 10 days I have lost 9 lbs! I've already sampled the new Simply Skinny Gold and love it!! Best product they have came out with yet!! I lost 5 pounds in the first week!! Supresses my appetite and also helps flush my body. I would say it is the closest product yet to Slim Trim U, which was the one I lost the most on in all the years of trying bee pollen. OMG - You guys are the bomb -- Gold reminds me of the old Gold. I am loving it! I finished day 10 and I lost 7 lbs girlfriend! I def don't crave sugar like I normally do, pop tates yucky now when I try and take a sip. Love Simply Skinny! I just wanted to text you to thank you for letting me part on your trial. The new Gold gave me just enough energy and appetite control to last the whole day. I liked how you just took two in the morning and done for the day. I took it for 10 days and lost 6 lbs. It is my favorite and con't wait till it comes out. Thanks for letting me be tester of the Simply Skinny Gold! I truly love, love, love it! I took 2 each morning with my water (because you always tell me to drink water) ha. I ended up losing 6 lbs in 5 days!! I gave the other to my bestie! I wanted her to try it! I want a bottle as soon as it's in! Day 7 of your Gold and I love it! I have lost 4 lbs but I eat!! lol! I still ate pizza and had beer but still losing!! I need a bottle now! There were several days that I was not hungry at all that I didn't realize that I hadn't eaten all day. They made me drink and drink water, which I needed help with. I can't wait until they are available! I just want to tell you that I never dreamed in a million years that I would find a product again to replace the old Slim Trim U until I tested Simply Skinny Gold! I couldn't believe it, from the first day of taking it I had next to no appetite, I had energy and best of all, I didn't snack which has always been a major problem of mine! It made me thirsty, I drank lots of water. This is my day 10 on Simply Skinny Gold and I have lost 9 lbs!! You struck GOLD! I just wanted to give you feedback on the 10 day supply of Simply Skinny Gold I tried. I did experience elevated energy levels thru out the day and seen a decrease in wanting to snack after meals. My appetite had decreased a lot during the last few days of taking the pills and I was very happy with the results! Please let me know when they become available for monthly supplies! Just wanted to give my feedback on the Simply Skinny Gold. I really liked it and had to actually make myself est. I experienced more energy with them and also had more of a detox effect. I'm so excited to buy them once they are available! Please let me know as soon as you have them in stock to purchase. I love this new stuff, I'm definitely not hungry through the day and I lost 2 lbs in ONE day! Why choose a bee pollen weight loss supplement? ​Many people are attracted to bee pollen simply because it's a natural remedy. Bee Pollen has been used for centuries to promote countless benefits which include not only weight loss but corrects chemical imbalances in the body that causes weight gain and retention, boosts the metabolism, burns calories and several other health benefits. Simply Skinny Gold will prove to be the best bee pollen weight loss supplement you own!